In the center of the sheet is a paddle boat’s “engine”. The external paddles are only suggested. The boat is propelled by using two pedals, which are linked by a belt to a reciprocating-motion device. A mechanism transforms the reciprocating motion into continuous rotary motion in order to turn the paddles. The device is shown in the foreground with a large flywheel. 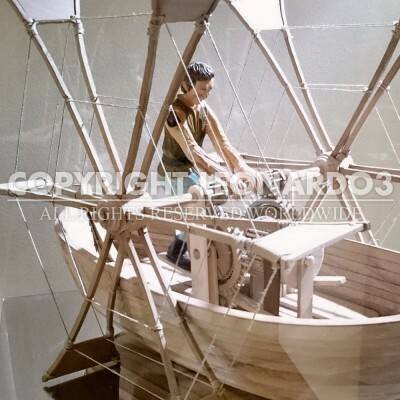 Leonardo was also interested in nautical studies (diving suits, submarines, underwater-attack devices to use against enemy ships, etc.) and developed some very original ideas. Earlier engineers had already examined the basic idea for the design found on folio 945r of the Codex Atlanticus. 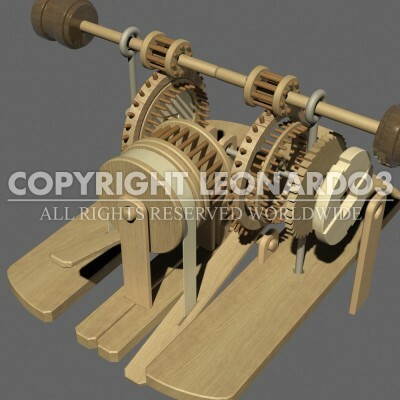 Leonardo used this idea to propose interesting and original improvements for the mechanisms to turn the paddles. Leonardo made all the sketches on this page around 1487-89 while he was in Milan.